A tragedy is sweeping over Japan at a steady pace. Hundreds of thousands of young men are turning their backs entirely on society and real life. They are choosing instead to lock themselves away, usually in their bedrooms, for years. They literally enter their rooms and refuse to leave. 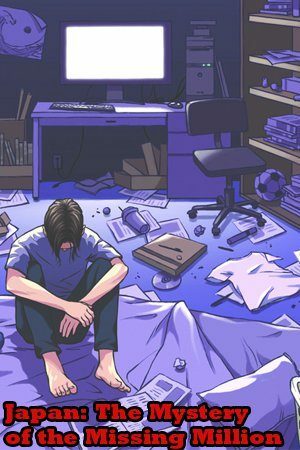 The phenomenon is called hikikomori in Japanese and it literally means ‘to withdraw from society’. It’s a highly sensitive subject and the parents of the recluse are usually filled with a deep sense of shame and guilt. The topic is rarely discussed openly and this means that there’s very little information available. Most of the sufferers of this condition live in the suburbs that surround Japan’s major cities. Recent surveys show that the majority are male and usually the first-born child. One young man took over the family kitchen and prohibited everybody else from entering. His mother only hears his voice when she takes food to him. He is somewhere behind a huge mound of garbage and she can’t see him. The young man refuses to allow anybody to throw away anything he has touched. The family ended up building a new kitchen because they lost hope of him ever coming out. After all, he’s been in there playing video games for over two years. Another young man has not left his room in four years. His mother says she knows he’s still alive because occasionally she hears the floorboards creaking. Nobody knows for sure how or what he eats. A third young man who had isolated himself for about two years, allowed the cameras into his room. Everything was oddly neat and well organized. He claimed to spend most of the day playing video games, reading comics, and listening to music. And just like those, there are many stories of young men who give up on society. Some seem to be unable to handle academic or job pressure, others simply got fed up of people and still others do it out of fear of not being good enough and anxiety about their future. After a few years, some hikikomori victims recover enough to re-enter society. Another young man who spent three years as a recluse is now a counselor working with a support group for parents. In Japan it takes parents up to four years of not seeing their child before they seek outside help. Is this condition exclusive to Japanese culture? If so, what is it about the country that makes young men prefer to hide out in an often dark and filthy small space? One thing is sure, Japanese society is harsh on those who are different and so the life of anybody who doesn’t fit into the mold can be very difficult. Also, Japanese teens are growing up under an overwhelming amount of technology, which seems to have replaced the inherent human experience, making teens handicapped when it comes to communicating honestly and openly with other people. Watch this now.